A team of Chinese and American scientists has learned how to maintain high fusion performance under steady conditions by exploiting a characteristic of the plasma itself: the plasma self-generates much of the electrical current needed for plasma containment in a tokamak fusion reactor. This self-generated, or "bootstrap," current has significant implications for the cost-effectiveness of fusion power. Magnetic fusion energy research uses magnetic fields to confine the fusion fuel in the form of a plasma (ionized gas) while it is heated to the very high temperatures (more than 100 million degrees) necessary for the ions to fuse and release excess energy that can then be turned into electricity. The most developed approach uses the tokamak magnetic confinement geometry (a torus shaped vessel), and it is the basis for ITER, a 500-MW heat generating fusion plant currently being built in France by a consortium of seven parties—China, the European Union, India, Japan, Russia, South Korea and the United States. In the tokamak configuration, the confining magnetic field is generated by external coils and by an electric current flowing within the plasma. The cost of driving these currents has a strong impact on the economic attractiveness of a fusion reactor based on the tokamak approach. One step to minimizing this cost is to make the external coils of superconducting wire. The second step is to take full advantage of a surprising feature of the tokamak configuration: under certain conditions the electric current in the plasma can be generated by the plasma itself ("bootstrap" current). 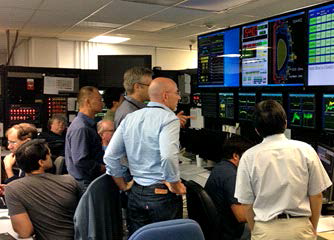 The recent joint experiment, carried out on the DIII-D National Fusion Facility at General Atomics in San Diego, involved scientists from the DIII-D tokamak and from the Experimental Advanced Superconducting Tokamak (EAST), a fusion energy research facility at the Institute of Plasma Physics, Chinese Academy of Sciences (ASIPP) in Hefei, China. Building on earlier DIII-D work, the experiment found that it is feasible for a tokamak to operate reliably at high fusion performance with most (more than 85 percent) of its plasma current consisting of bootstrap current. These conditions were maintained for several seconds, beyond the characteristic time scale of the plasma current evolution, and limited only by DIII-D pulse length constraints. "It is often said that a plasma with a high fraction of self-generated (bootstrap) current would be difficult to control. However, these experiments show that a high bootstrap fraction plasma is very stable against transients: the plasma seems to 'like' a state where a large fraction of the current is self-generated," said Dr. Andrea Garofalo, General Atomics scientist and co-leader of the joint experiment. These results build the foundation for follow-up experiments to be conducted on EAST, where the superconducting coils enable extension to very long pulse, and verification of the compatibility of this regime with reactor relevant boundary conditions. ASIPP Director Prof. Jiangang Li remarked, "After the successful joint experiments in DIII-D, I am fully convinced that the DIII-D results can be reproduced on EAST in the near future, which will help us achieve the demonstration of high fusion performance in long pulse tokamak discharges." Ok, I'm thoroughly confused here. When did they actually get a fusion plant to work so well that people are now spending money to build a 500 MW fusion heat generating plant? They didn't, 24volts. Just like the Higgs boson, the results are predicted mathematically before construction begins. It's the way they do science these days, you know. All ya gots ta do is use google. "ITER is designed to produce approximately 500 MW of fusion power sustained for up to 1,000 seconds (compared to JET's peak of 16 MW for less than a second) by the fusion of about 0.5 g of deuterium/tritium mixture in its approximately 840 m3 reactor chamber. Although ITER is expected to produce (in the form of heat) 10 times more energy than the amount consumed to heat up the plasma to fusion temperatures, the generated heat will not be used to generate any electricity"
-Or you can let others here feed you which is a little pathetic. TheGhost ofOtto1923, I thought it was going to be some sort of real power plant from the way the article was written. Your right though it would have been much more useful to check with google vesus getting the usual insult from people like you. Fusion reactor research is like taking money and throwing down a well. It is not boycotted. It had it's day and got ample funding to show that it worked. It didn't work so the (limited!) science funds gut distributed to other sectors. End of story. Laziness and inconsideration are insulting yes? This is the internet where people can educate themselves easily. If you ask for info and get half-assed opinions you don't learn anything do you? Better to seek out experts and post their quotes. In another thread I posted some info about gas phase ion chemistry. -Plasma chemistry offers the ability to create and store materials while suspended in magnetic fields, such as antimatter compounds. Bulk storage and transport of such materials will be done in closed magnetic bottles such as tokamaks. Knowing how to confine, store, manipulate, and transport such materials is essential to the future, and research into these things must be done NOW. The public understands 'free energy' in the context of the 'global warming crisis' and will pay for it just as they accepted the soviet threat and were thus willing to pay for the production of many kilotons of fissiles, the most valuable material our civilization now possesses. We are a crisis-driven species. Oh well. This is how things get done.